I love beauty and skin care products. I don't think there is a year that has gone by that I didn't ask for something in those categories for Christmas. I'm so excited to share with you Wilma Schumann’s Hydra-Gel Masques. 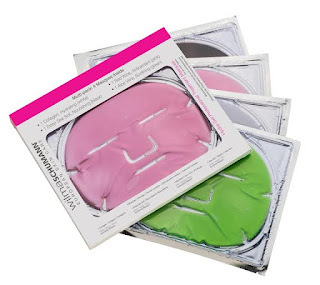 This is a fun, easy to use product that has wonderful skin care benefits! Purchase at wilmaschumann.com or at your local CVS! I used the Aloe Vera mask for this review. You are supposed to lay down while using it - which I did - but I couldn't help but take a quick picture first. This mask felt amazing. It was cool and refreshing. It also smelled very nice with a clean scent. I have somewhat sensitive skin and this was a perfect match for me. After using my skin felt soothed and refreshed. I will definitely use these again.